While only a member of the Geek Squad maybe able to customize your iPhone or desktop; any angler can customize a casting or jigging spoon. The best part about doing it yourself is casting or jigging spoons can be purchased without hooks or split rings reducing the cost and allows the angler to build it to their own specification. 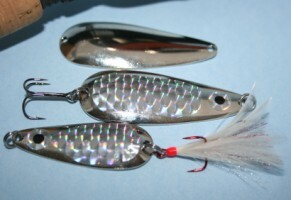 Casting spoons are spoon shaped lures made to be fish in shallower water than a jigging spoon and wobbles when retrieved or trolled to attract fish, jigging spoons are double flat sided baits, or can be, one flat side and one tapered “keel-shaped” side for a fluttering action and made for fishing in deep water or vertically. Although the popularity of casting spoons has declined over the past decade, the demand has increased lately with professional anglers winning tournaments and catching giant stringers of bass on them. The only drawback is most of the spoons have little, if any finish work. A wise angler can take a few components, fishing supplies, and make a killer casting spoon. Jigging spoons are like the linemen on a football team. They do all the work, do not stand out among the stars, and get no glory; however, they get the job done. Just like high priced California swimbaits or expensive Japanese jerkbaits get the glory and articles written about them, but a casting or jigging spoon catches fish with no fanfare, stuck deep into an anglers tackle box. It’s up to the angler to customize their casting or jigging spoon so it stands out and appeals to the fish. 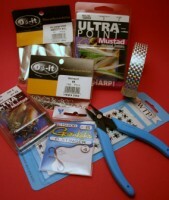 To customize your casting or jigging spoon begin by checking out what components and fishing supplies are available. One company, Do-It Molds, has a wide selection of all the components, tools, and fishing supplies needed to customize your casting or jiggingspoon. Begin customizing your spoon by sticking reflective decals or cut your own pattern from reflective WTP Roll Tape, apply decal tape to the spoon then add a 3-D stick-on fishing lure eye, put on the front split ring and a Gamakatsu G-Stinger hook to increase your hook-up ratio, attach the back split ring with an undressed treble hook or Feather Dressed Ultra Point Mustad Hook for extra flash, light, and action to the spoon. 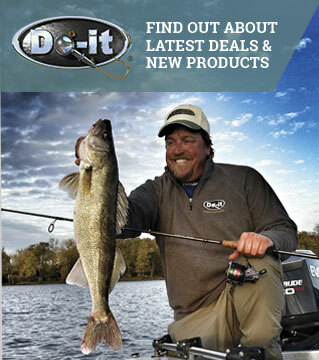 Do-It Molds has pre-made Nickel Plated Casting Spoons, or lure molds for both casting and jigging spoons. These molds make it easy for an angler to pour and design their own spoons with unique styles or action. It’s all about customizing your lures. I mean, why not catch more and bigger fish by making your own casting or jigging spoon look more realistic? 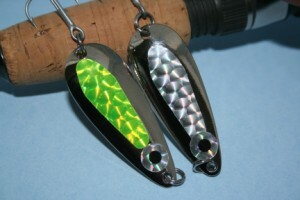 You customized your iPhone, why not you’re casting or jigging spoons.